Wow! It's hard to believe we are already at the beginning of July. June left us off with an amazing start to our wedding season! Throughout the month we played at a wide variety of venues, some in different states, and some we've never gotten to see in person before. Aram Riley had the pleasure of performing for Amanda and Glenn at the Moon Dancer Winery in Wrightsville, PA. The reception received some unwanted rain but that wasn't going to stop the party! Amanda and Glenn decided on keeping things simple and booked Klock Entertainment solely for DJ and coordination services. Check out the footage below! DJ Aram Riley of Klock Entertainment at Moon Dance Winery from Klock Entertainment on Vimeo. On that same night Jason Klock was honored to be a part of Haley and Steve's wedding at the Bent Creek Country Club in Lititz, PA. This couple had decided to implement various forms of lighting, consisting of controllable uplighting, intelligent lighting, a monogram, and a cake spot light. Check out the footage below to see these features first hand! Wedding At Bent Creek Country Club, Lititz, PA | DJ Jason of Klock Entertainment from Klock Entertainment on Vimeo. Back in Harrisburg Nick Fortini DJ'ed a Mitzvah for the Borr Family. This party was fun from start to finish! The Borr family had gotten uplighting and intelligent lighting. They also decided to book our Klock Photo station which allowed the guests to have green screen back drops and text pictures right to their own personal devices. Nick Fortini of Klock Entertainment at the Blue Ridge Country Club for The Borr Family Bat Mitzvah from Klock Entertainment on Vimeo. Josh Wagner was part of an amazing reception at the West Shore Country Club. This party was absolutely crazy! 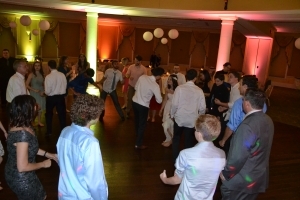 Josh played a wide variety of music to keep the floor packed all night long, check out some pictures below!